While it goes without saying here in the Lone Star State that everything is bigger in Texas, it doesn’t mean that bigger is always better. When it comes to Leland’s small-size prefab cabins, there are some wonderful benefits to going for a slimmed-down style. An easy perk to point to is cost efficiency. 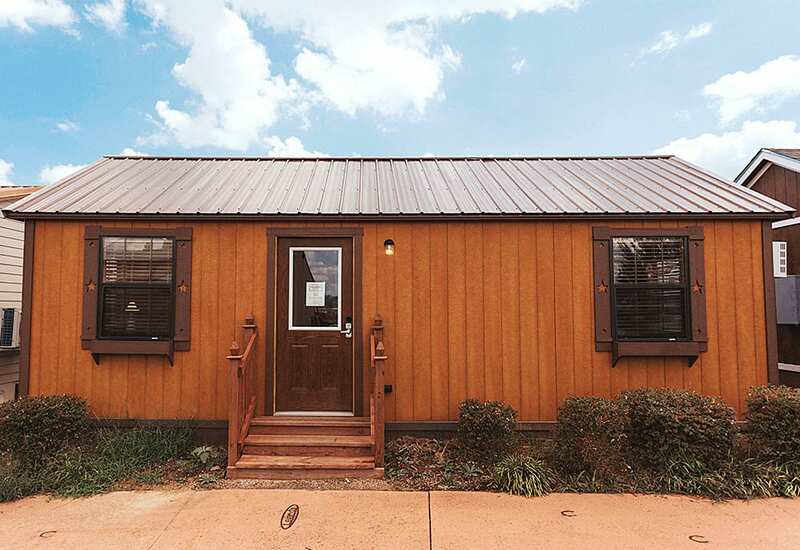 Buying one of the small premade cabins or tiny homes like The Stag goes easy on the wallet, which leaves you with more money in the bank each month. When your home costs less than a pickup truck or SUV, you know you can sleep peacefully at night and not have to worry about how you’ll make the next mortgage payment. But what are the other upsides to owning a small Texas log home? Here’s our list of some of the benefits of going with a small-size home. When you have 2,000 square feet of living space, somebody has to keep it clean. And most likely that somebody is you. There are bedrooms that need tidying, a kitchen that needs wiping down, and a living room that needs sweeping up. And don’t get us started on the bathrooms. With a small-size cabin like the Chisholm Trail, you don’t have unnecessary space. Everything that you can deem as “excess” has been excised, and what’s left are just the basics: kitchen area for meals, bathroom for cleaning up, and living space for relaxing. And this smaller footprint means fewer messes, which means more free time for you. In many suburban areas, McMansions have sprung up that offer cavernous spaces where families lose each other in the endless rooms. And while these larger homes offer beauty and a bit of status, they require a hefty budget to furnish. Bed frames, sofas, sectionals, art for the walls, rugs for the floors — it all adds up. But with smaller manufactured log cabins, the furniture budget can be lean. Simple living is key. And once all the furniture is in place, you might find you have money left over for outdoor toys like a kayak or bicycle or fishing pole. Living lean is living green. Large houses require an enormous amount of energy to cool in the summer and heat in the winter when compared with a smaller space. The money you save on your electric, gas, and water bills can be shocking. Your cabin’s smaller size allows for greater flexibility and creativity. Consider harnessing solar energy to power it, catching rainwater for plants and gardens, and cooling down the entire space with a single ceiling fan. Let’s face it, the holidays can be stressful. According to a poll by the American Psychological Association, 25 percent of Americans reported “extreme stress” during the Thanksgiving and Christmas holidays. Lack of time, lack of money, and family gatherings are all part of the tension-filled mix. 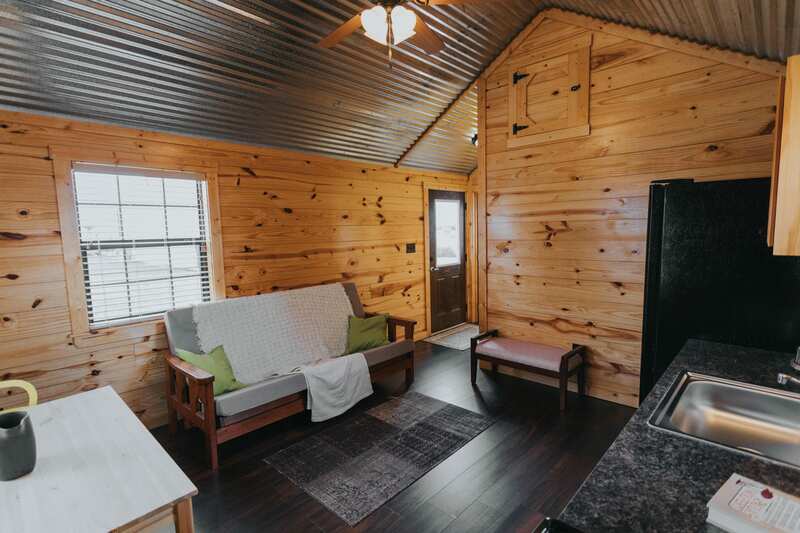 When you live in one of our premade small cabins like The Brazos, you likely won’t be able to host many holiday guests. They simply won’t fit inside the space, so the family will have to go to your sister’s house. Which means you have a place to escape to when Uncle Bob keeps bringing up politics and Aunt Barb won’t stop talking about your old girlfriend. This is an upside that can give you real peace on earth. When you live in a traditional home that features multiple bedrooms, a game room, maybe a basement decked out with a flat-screen TV and video games, you’re an easy target. Your place is comfortable and offers all the amenities. And while you want to be there when a sibling needs help, you don’t want them settling in for too long. With a smaller home like one of Leland’s lean, cost-saving cabins, you don’t have the space to take in your brother and his girlfriend. Maybe a night or so on an air mattress, but that’s about it. Consider it another of our ways of keeping family harmony. These are just some of the ways — from practical to humorous — our smaller cabins can simplify your life so that you can have more time and money to focus on the things that bring you real joy. Money for that trip overseas, time to pursue an artistic talent, freedom to commit to an outdoor pursuit. Stop by our Grandview showroom, the biggest cabin supercenter in Texas, and see our manufactured log cabins for yourself. They may be small, but they’re mighty. 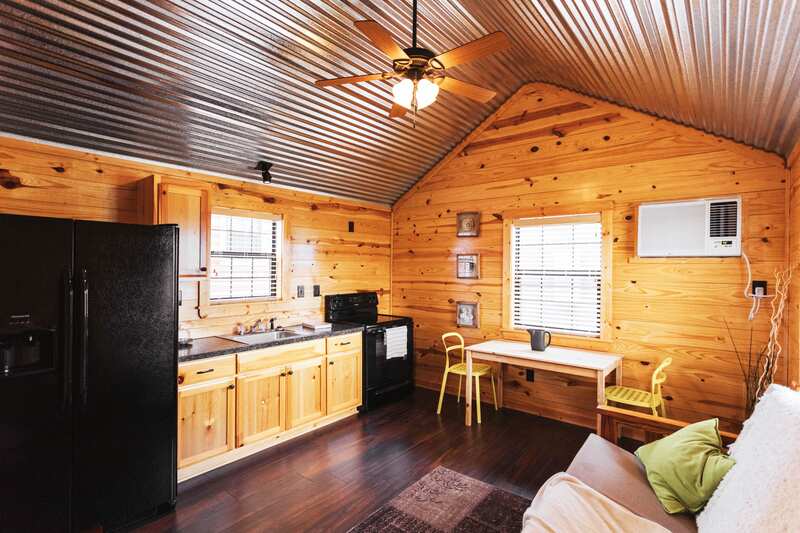 Let us show you all the benefits of living lean in a small-size Texas-built cabin. You’ll never look at a floor plan the same way again.